December 1st, 2018 is Ultimate Music Theory's 10th Birthday. Happy Birthday UMT! I wanted to take this opportunity to share with you my own personal journey with Ultimate Music Theory. This is a personal blog - no teaching tips, no Pop Quizzes! Just me and UMT! I started teaching piano when I was 13 years old. (I will be 56 on December 15, 2018.) Having special learning needs myself, I have always struggled with Theory. I could see what I was supposed to do/get, but I could not always see how to do/get it! (Does that make sense? LOL) So I made it my goal to figure it out. In January, 2009, I heard about this new Ultimate Music Theory Series. When my 3 books (Basic, Intermediate and Advanced) arrived, I started doing the Workbooks myself. I could not put them down. Theory finally made sense to me! I was so frustrated trying to find the right way to explain a concept to a Student so that they "got it" (especially when I didn't "get it"!). I remember teaching Modes by saying "I do not understand Modes, I have no clue what they are or why we use them, but they are on the exam and you have to know how to identify them. So lets write out the C Major Scale 7 different times starting on different notes to create each pattern of tones and semitones. Then name each pattern." ARGHGH! So, there I was - working through the Ultimate Music Theory Workbooks and I came to the chapter on Modes. Taking a deep breath, I started to read. Then I started to cry. Yes, cry. I GOT IT! I understood Modes! My first instinct was to contact all my past Theory Students to apologize to them. Instead, I emailed this amazing Educator - Glory St. Germain - to say "THANK YOU"! And that is how my journey with Ultimate Music Theory began! In the past, I have attempted to email Theory Authors to ask questions but I have never received a response. My response from Glory arrived the next day. We started communicating and I asked her if she would be open to feedback on these First Edition Workbooks. And she said yes! Glory still has the 15 page email that I sent her with thoughts, praises and suggestions. By the end of this first week of communication, Glory asked me to edit her new Prep 1 Rudiments and Prep 2 Rudiments Workbook. So, for 6 months, we worked via Skype and emailed scans to create this new series. Glory begged me to come to Winnipeg that summer. We had 2 books at the Printers and we had never met. So, I did some personal work (okay, a LOT of work) to calm my anxiety and panic attacks...and I actually got on a plane and flew to Winnipeg (all by myself). Yes, I know it doesn't sound that "big", but when you deal daily with depression, anxiety and panic attacks, doing something outside of my comfort zone is huge. But I did it. That summer, in one week, we learned how to use Finale and Page Plus. We could actually WRITE our Workbooks instead of sending them to be "set" and making adjustments on scanned PDF pages. What a week! Glory and I developed a really unique writing arrangement. Glory is "Yogi Bear" and I am "Boo Boo"! And together, we became a team. 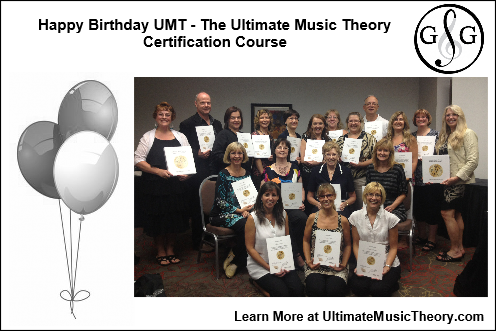 In 2012, we launched the Ultimate Music Theory Certification Course as a live 3 day teaching course. Here I am, being in the "background" as the Certification Course Host, and I am being blown away by what I am learning from Glory. LEARNING STYLES! Oh my goodness! I never knew about Learning Styles! I still have my notes (pages and pages) as I matched Students with their Learning Style and was inspired. I realized that I could teach TO each Student using THEIR Learning Style Language. This was a game changer for me. I used to think that if my Student did not "get" a concept, I was a failure as a Teacher. I finally understood that I was trying to teach all my Students using my Learning Style Language instead of teaching TO each Child. And the Ultimate Music Theory Certification Course changed my teaching (and my relationship with family and friends) forever. 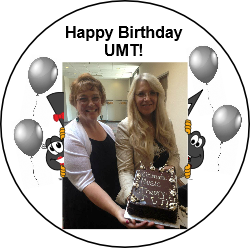 Happy Birthday UMT - The UMT Series Continues to Grow! With Glory's support, love and encouragement, I began writing Blogs for the Ultimate Music Theory Website. Knowledge is meant to be shared! If something worked for me, I wanted to be able to bring that idea to other Teachers. When we realized that Teachers needed Practice Exams for their Students, Glory inspired me to write them, and the Ultimate Music Theory Exam Series was created! If a Teacher has a question, we are only an email away! I've given Skype Lessons to support and inspire Teachers from Alaska to Florida! Every time I help a Teacher, I learn something new too. These Ultimate Music Teachers have become friends. Our new Ultimate Music Theory Facebook Groups give Teachers the opportunity to be a a part of the Ultimate Music Theory Family. 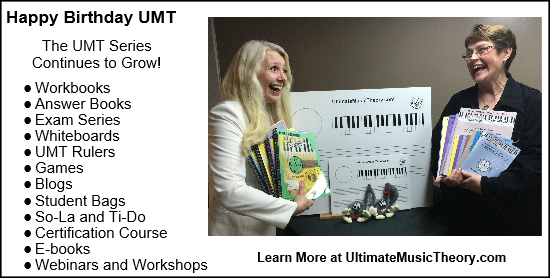 Ultimate Music Theory has now published 51 Books! We have created the Ultimate Music Theory App. We have online Courses to support Pedagogical Development. There are so many FREE RESOURCES to explore. And now we have So-La and Ti-Do, these 2 fun Stuffies who bring so much happiness to my own Students. Happy Birthday UMT - The Adventures of Yogi & Boo Boo! Glory and I have toured across Canada and the United States. We have given Workshops and have participated in Conferences from the West Coast to the East Coast! My passion has always been to support Teachers. When I started teaching, there was no one who I could ask for help or support. Teaching can be so isolating - it is like being on an Island surrounded by sharks! If you have a question or need an idea, you cannot just lean over and ask a co-worker for help. I absolutely love that Glory is just as passionate as I am about providing Teachers with tools for success. Together, "Yogi & Boo Boo" are on a life-long adventure to bring the very best Theory and Teaching Materials to Teachers and Students across the world. Watch Our 10th Year Celebration! Ten Years Old is a BIG deal! Thank you for sharing our walk down Memory Lane - December 1st, 2018. A big thank you to Vidday.com for putting this birthday video montage together. Happy 10th Birthday Ultimate Music Theory! Enriching Lives Through Music Education! Boy, has music instruction changed for the better in the past ten years! I too was one of those isolated music teachers – depending on the knowledge I could glean from method books, my previous instructors, and the occasional workshop or music festival. I am so happy and encouraged by the online support I have received from you two ladies! Thank you so very much! All the best for the next ten years!